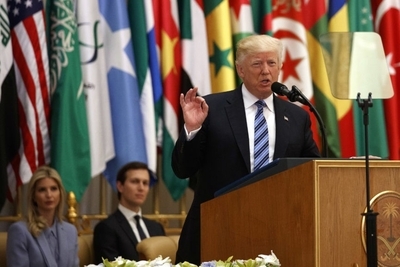 President Trump marked another turning of the page from the Barack Obama years with his highly anticipated speech delivered in Saudi Arabia on his first trip overseas. While there were some similarities with Barack Obama's major address on June 4, 2009 in Cairo, Egypt—such as a willingness to work with those who responded in kind to America's "outstretched hands"—most striking were the differences. Generally speaking, and put in more colloquial terms, the differences between the two approaches and speeches can best be explained by the following summation. In 2009, Obama essentially told the Muslim world that he understood them and that their blemishes were similar to America's; that he was aware of and sorry about America's contribution to their extremism; and that the United States would be more tolerant in the future—that with respect for each other, a new partnership could be built. In 2017, President Trump essentially told the gathered leaders that he is aware of the problem in Islam, but he's not going to get into a debate over why and how it happened. The fact is that it is their problem to deal with and he'll hold their political leaders responsible for handling their business. There exists a common set of interests upon which a new partnership can be built. In true realist form, Trump's speech was designed to speak directly to the leaders of these countries. He's now seen their faces and has their names and, perhaps more importantly, their telephone numbers, which he can now call to work on an assortment of challenges. Contrast that with Obama, who spoke over Muslim leaders' heads and directly to "the people of Egypt" and Muslims at large. He sought to create a "partnership between America and Islam" that was always a problem. An American president is the leader of a country with a constitution that promotes freedom of religion and favors none above the other. America and its representatives can make deals and reach understandings with governments and partner with their people—even with the adherents of a religion in a particular country. But an American president cannot partner with a religion. Trump indicated early on, "I stand before you as a representative of the American people"—he was not there as the representative of Christendom. He went on to meet the pope a few days later, as a guest of the Vatican. Whereas George W. Bush pursued a "Freedom Agenda" in the aftermath of 9/11, which meant promoting democracy abroad as a means to address the underlying causes of Islamism, Trump never mentioned the word "freedom" or "democracy" at all. Nor was it a prominent feature in Obama's speech: "No system of government can or should be imposed by one nation by any other." One may therefore surmise that America's costly foreign adventures are a thing of the past. For Obama, that decision was initially designed to leave a far lighter American footprint in the Middle East and pivot to Asia; for Trump it meant that "we are not here to lecture—we are not here to tell other people how to live, what to do, who to be, or how to worship." In a noticeable—if not expected—change, Trump made no apologies for past American behavior, and avoided manufacturing moral equivalencies and assigning false parallels. He did not seek to cast the rise of Islamism as a response to the West, or explain how "tension has been fed by colonialism that denied rights and opportunities to many Muslims" as Obama opined in his opening. Nor did Trump assume the role of an Islamic scholar or lecture his audience on his view of Islamic jurisprudence (i.e., the partnership with the United States "must be based on what Islam is, not what it isn't"). Neither did he quote the Koran as Obama did. There was also a major difference in how both handled the issue of radical or political Islamism. Trump repeatedly made the point that it is at the core of the problem and is the responsibility of the political leaders to address: "Muslim-majority countries must take the lead in combating radicalization" and "Muslim nations must be willing to take on the burden, if we are going to defeat terrorism and send its wicked ideology into oblivion." If George W. Bush leaned too far toward democracy promotion, then Trump's more neutral stance may not have given Middle East moderates or liberals much to build upon. Barack Obama, by way of contrast, weighed in on the issue and sided with political Islam, stressing the importance of respecting the freedom to practice Islam and listing only two criteria for America's partnership: "Suppressing ideas never succeeds in making them go away. America respects the right of all peaceful and law-abiding voices to be heard around the world, even if we disagree with them." And several times during his Cairo speech, Obama defended the right of Muslim women to wear the hijab, but never said they should have the right not to wear one. He appeared to be sending a message to France from Egypt, rather than to Afghanistan. President Trump was wise not to wade into these waters. He said instead, "The nations of the Middle East will have to decide what kind of future they want for themselves." Both were careful to give the standard American disclaimer—"This is not a battle between different faiths, different sects, or different civilizations"—but Trump also dropped the following hammer: "This is a battle between barbaric criminals who seek to obliterate human life, and decent people of all religions who seek to protect it. This is a battle between good and evil." The "good and evil" phrasing harkens back to George W. Bush, and Ronald Reagan before him. For Trump the matter was fairly black and white. It wasn't as specific as Bush's "either you're with us or you are with the terrorists" formulation, but it also wasn't shrouded in the gray shades of Obama's moral relativism. It also marks a key difference in the ideological chasm between the political Right and Left. At its most basic level, for example, the Right tends to seek the defeat of evil, whereas the Left seeks justice. Interestingly, President Trump avoided using the phrase "radical Islamist terrorism," which he chastised Democrats for avoiding. He did use the word "terrorism" and a host of its variants, which Obama couldn't stomach in his own speech—an avoidable hypersensitivity, given that Arab and Muslim leaders also describe ISIS and Al Qaeda as "terrorists." In a sense, it was a missed opportunity for Trump to make the clear distinction that Obama couldn't, because it is the use of radical interpretations of Islam that justifies terrorism as a tactic. Furthermore, America went to war with the ideology of Nazism and had a Cold War against Communism, not against gas chambers and bullets. Muslim leaders are attuned to the difference between those using Islam to justify terrorism and those who use it to promote peace, and so should be America's leaders. It is understandable that some critical language was best left unspoken, at least in public. After all, surely it is in poor taste to slip mud in the host's punchbowl if staying for refreshments after such a lavish welcome. But it would have been nice to find a way to express appreciation without being so effusive. For example, despite the warmth displayed by the Saudi host, King Salman, his staggering "tens of millions of dollars in bank transfers" in the 1990s towards "financing militants' activities in Pakistan and Bosnia" are public knowledge. 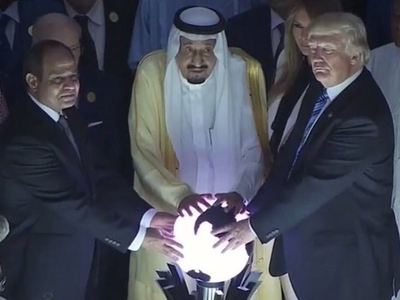 From that well in Pakistan, exported by the man who is today king in Saudi Arabia, sprang Al Qaeda and the Taliban—the core of the problem Trump's speech was meant to address. In an about-face from the Obama years, Trump repeatedly singled out Iran: "From Lebanon to Iraq to Yemen, Iran funds, arms, and trains terrorists, militias, and other extremist groups that spread destruction and chaos across the region. For decades, Iran has fueled the fires of sectarian conflict and terror." While that is all true, the same could be said for his hosts and the Sunni Salafi and Wahhabi extremists they've spawned. Perhaps it would have been a little too on the nose to have said, "The fact is that I realize Iran is a greater long-term threat given their pursuit of nuclear weapons, superior control over their terrorist proxies, and better ability to organize and project power. Should Sunni leaders learn to organize better and come to the cusp of having nuclear weapons, they will be a greater threat." Trump's reversal nevertheless signified an end to Obama's embrace of Iran, and was welcomed by Sunni states. 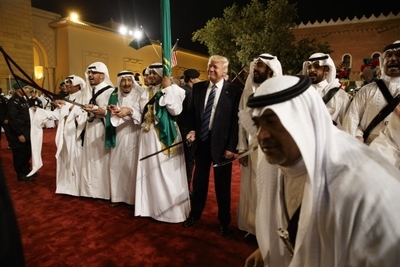 President Trump also missed an important opportunity on the Arab-Israeli issue. The centerpiece of his approach to peace appears to be building support for the process from the outside in, which would presumably make Palestinian and Israeli concessions easier to stomach. He could have used the opportunity to publicly ask the gathered leaders to contribute toward that end. He could have pressed them to normalize ties or extend themselves in partnership with Israel, rather than keeping those contacts under the table. He also could have pointed out that Arab leaders have for too long used Israel to justify an array of self-defeating policies, and to distract their own populations. President Obama addressed this last inconsistency in his 2009 speech, but then went on to justify Israel's existence as a direct result of the Holocaust—a cynical screed that ignores history generally and all of Jewish history specifically. In fact, it was on the topic of Palestinian-Israeli peace where Obama's manufacturing of false moral equivalences was most damaging. On balance, if in the end what Trump forgot to say about the Palestinian-Israeli conflict is remembered most, then Israelis will likely toast to presidential amnesia. Trump felt the urgent need to turn the page in the Middle East, just as Obama did eight years earlier. The key feature absent from President Trump's new approach is the promotion of American values abroad. Otherwise, to put it in Star Trek terms, the new policy appears to boldly go where we've mostly gone before. 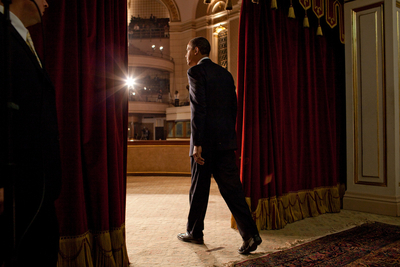 Obama's 2009 Cairo speech was marketed as "A New Beginning," and emphasized mutual respect as the path to partnering with the United States. In 2017, Trump, for his part, focused on mutual interests as the key ingredient. Trump also gave that approach a name: "Principled Realism." From this standpoint in history, it is easy to connect the dots between Obama's 2009 vision in Cairo and the policies he pursued for two terms in office. Presumably historians will be able to look back on President Trump's speech and see how he translated those words into policies and actions, strategies and tactics, or how he breathed life into his doctrine of "Principled Realism." It remains to note that within a year and a half of Obama delivering his speech to Muslims in Egypt, they rose up and deposed their leader. The Arab awakening inspired by Tunisia and Egypt continues to reverberate—often violently—throughout the region. That is not to say that Obama was responsible for the long-brewing forces in the Middle East. It is, however, a reminder that with Trump's own speech now on the books, it would be advisable to keep one's seat belt securely fastened with hands and feet inside the vehicle.